The 2015-16 Herder Memorial Trophy is on the line with the Grand Falls-Windsor Cataracts of the Central West Senior Hockey League (CWSHL) set to face off against the St. John’s Caps of the Avalon East Senior Hockey League (AESHL). The format this year mimics some of the most successful Herder Championships, pitting the Western teams against the Eastern teams. As the premier hockey tournament in Newfoundland Senior Hockey, there are many who feel that the results of this 5-game series is a foregone conclusion. Many have picked the Grand Falls-Windsor Cataracts as the favourite to walk away with the trophy given their dominating performance in the CWSHL The fans of the AESHL are just as confident and feel that their team has a great chance to win the Herder Trophy. From the Cataracts, they have arguably the best goaltending in the province at the moment. A.J. Whiffen had a relatively easy time during the CWSHL finals but as some point out, the Corner Brook Royals never mounted much of an offense throughout the series. Some credit this to the Cataracts defense and say this will be improved with the return of Rodi Short for game one of the Herder. Whiffen was shaky at times throughout the series whether it was from being inactive in the net or not is yet to be seen. Offensively, the Cataracts have danger throughout the lineup. Cam Fergus, Danny Wicks, Brandon Bussey and Steve Yetman and a total of 6 players in the top 10 playoff scoring for the CWSHL. To address what many people see as the inequality between the caliber of play between the leagues, the AESHL have picked up some great players. Chris Sparkes, the leading AESHL scorer in the regular season will be front and center for the St. John’s Caps offense. He will be joined by Jeremy Nicolas, Brandon Pye, Dylan Sheldon and Mark Tobin. All players bring some great skills to the Caps as part of their hockey resumes. These additions add scoring punch and some great defensive skills to an already strong St. John’s Caps lineup. Overconfidence may be something may hurt the Cataracts. There is no way they should underestimate the talent of the AESHL players. The AESHL contingent should not be looked at as the “other” senior league. The players in the league are talented and many have opted to stay in the AESHL rather than jump to the CWSHL. It is not as simple as these players cannot compete at the semi-professional level touted by the CWSHL, there are many factors that have these players staying in the Avalon league. For those writing off the St. John’s Caps, one should be reminded of Herder history. If we look back in history of the Herder, 40 years ago in Herder final Grand Falls won game one of the Herder by a score of 8-3. However, the Caps won next 4 & Herder outscoring Cats 25-9. We have also seen teams like the Flatrock Flyers (2003) and the Southern Shore Breakers (2004) win over the Corner Brook Royals, despite those teams being considered underdogs in both those years. We also saw the Conception Bay North Cee Bee Stars win three consecutive Herder Memorial Championships from 2006-2008 when facing off against the Deer Lake Red Wings (who were also favourited to win those years). Will we see that this year? One thing is certain, hockey fans will be treated to some great hockey. 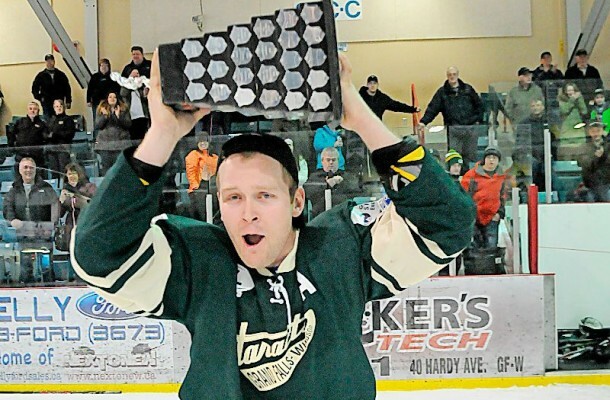 The Herder Memorial Trophy always brings out the best of both leagues and it is a great to see senior hockey alive and well in the province. Game one is slated to start at 8:00 pm in Grand Falls-Windsor at the Joe Byrne Memorial Stadium.